There's nothing quite like the feel of unboxing a new PC. The smell of the case, the squeaky sounds the styrofoam makes as you wiggle the machine out of the cardboard - the joy of booting the operating system for the first time and having everything run so cleanly and smoothly. Six months later, though, that same system seems bogged down and sluggish, and you're positive that you haven't taken on any spyware or viruses that could have impacted system performance. What gives? Have you ever considered cleaning your registry? Oh, you haven't? The more you use your computer, the more gunked up your Windows registry becomes - applications add unnecessary lines to the registry, and installing new software leaves setup files in the registry that are no longer needed. All of this electronic detritus makes your computer run as if it's on a set of flat tires, and more prone to crashing. You could try going into the registry and deleting entries that you don't recognize - a process that only invites catastrophic failures if you trash the wrong stuff. Or, you could take the easy route and just use Wise Registry Cleaner. 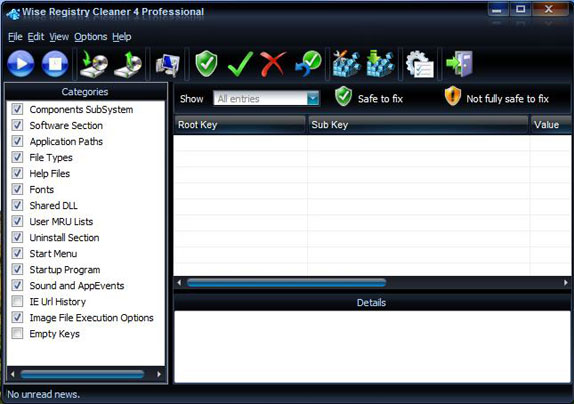 Wise Registry Cleaner is the only way to safely remove extraneous entries from your Windows registry. Using Wise Registry Cleaner, you can scan your entire Windows registry, and the program will flag orphaned or bad entries, even letting you know which entries are safe to delete and which aren't. You can even export registry entries to an Excel spreadsheet file. And, if messing with your registry makes you all nervous and anxious, Wise Registry Cleaner also lets you create a backup copy of your registry which you can easily restore. With a clean registry, your computer will be flying as fast as the day you unboxed it! But wait, there's more - Wise Registry Cleaner also gives you the power to optimize your system for even better performance. Just run the auto-optimization wizard, and Wise Registry Cleaner tweaks the disk cache, desktop menu, file system, network settings, and boot speed to ensure maximum performance!